Posted January 6, 2018 by jonmroth & filed under News. This year, in my ongoing conversations with fellow kidlit creators, I’m going to focus on members of the Electric Eighteens, a group of middle-grade and YA debut authors. 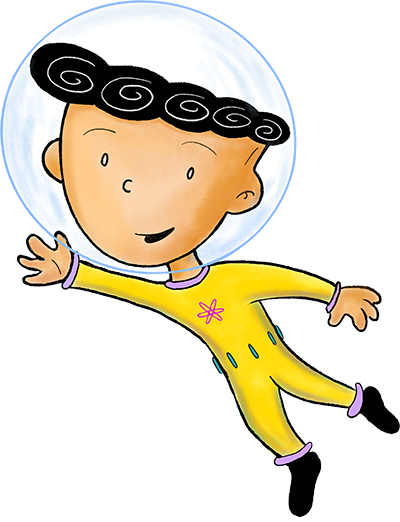 First up is Jackie Yeager, whose exciting STEM-friendly novel, SPIN THE GOLDEN LIGHT BULB (Amberjack Publishing), releases January 9th! Me: Can you sum up your book for the uninitiated? Jackie: Sure! 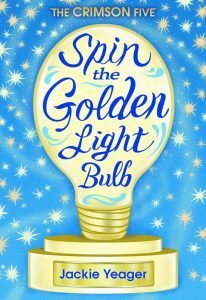 Spin the Golden Light Bulb, a middle grade story of magical realism, is set in the year 2071. Eleven year-old Kia Krumpet, who has trouble keeping friends at school, is determined to build the 67 inventions she has thought up. But at the end of sixth grade, kids all over the country are sorted, forced to study one academic program for their remaining school years. Therefore, kids are forbidden to build inventions unless they earn a place at PIPS, the Piedmont Inventor’s Prep School. When Kia and four other kids in NY state are selected to compete for spots at PIPS, they travel to Camp Piedmont, training camp for the Piedmont National Finals, where they encounter a world full of floating playgrounds, switching bunk beds, and robotic monkey assistants…and a technical task they must solve as creatively as possible against forty-nine other state teams. But working with teammates is hard and the level of competition is beyond what even Kia is used to. She and her teammates must learn to work together and create something incredible if they have any chance of earning their place at the best inventor’s school in the country—and keeping their newfound friendship intact. What sparked the creation of your story? For several years, I coached my kids’ middle school Odyssey of the Mind teams. The creative problem-solving competition involves solving a long term problem over several months by creating an object and then presenting it to a panel of judges in the form of a skit. In 2011, when my son was eleven, his team did very well and earned a chance to compete in the World Finals. It was an incredible several months for him, for his four teammates, and for me! After that trip, I realized I had a really great story in the making. That competition, along with the experience they had together as a team, was the springboard for Spin the Golden Light Bulb. The book isn’t about Odyssey of the Mind, but it was definitely inspired by it. It takes me a long time to formulate an idea for a story. I’ll spend months walking around in a fog, dreaming up characters and a rough plot before I sit down to write anything. I always start with a main character and put them into some sort of intense situation. Once I have that, the rest comes more easily. I make a loose outline and draft from there. But I’m not someone who can draft a whole manuscript without revising. I would be a horrible candidate for NaNoWriMo! I draft a few chapters and then revise, then draft a few more and then revise all that I’ve written to that point. It seems to take me forever to complete a manuscript! Once I write The End though, it’s actually pretty good—not perfect or polished, but not awful! Aside from the fact that it took me such a long time to find an agent, I’ve been pleasantly surprised how smoothly the publishing process has gone. I had heard some horror stories through the years but I’ve been fortunate not to run into any problems with publishers, editors, etc. 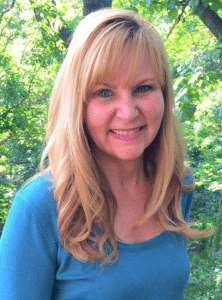 I signed with a new literary agency, a new agent, and a relatively new publisher. They all took a chance on me and I suppose I took a chance on them as well. It could have been a recipe for the perfect storm but instead it has been a perfect collaboration. I guess I’m surprised (and thankful!) at how wonderful the whole journey has been! The obvious and not-so-obvious influences on Spin are…? The obvious influence on this book has been the Odyssey of the Mind competition and the kids I’ve coached. If you’ve ever participated in OotM, you’ll notice many similarities to the Piedmont Challenge and the Piedmont National Finals! The not-so-obvious influence? Nacho Cheese Ball! You’ll have to read the book to find out what that is, but an imaginary version was created by my real life Odyssey of the Mind team for the World Finals. This and other parts of their real life skits are sprinkled throughout the story. I’m with my family a lot. Our house is always busy with teenagers and I love that! Just hanging out at home—when we are all home, is my favorite. With my daughter in college now though, I’d have to say I spend most of my time at hockey rinks, or track or cross country meets, watching my son in one of his many sports events. But I love going out to lunch, dinner, or even coffee to catch up with my husband or friends too. Chatting is my favorite thing to do, I guess! I would tell kids that writing is the best way to become better at writing, but traditional writing is not the only way it has to happen. I spent my childhood writing plays and skits, and thinking up cheers for my cheerleading squads—not very traditional! If you love words, play around with them in any way that makes sense for you, because if you love doing that, you’ll keep at it—you’ll keep writing, and that’s how you’ll become really great at it! I would tell adults who want to write for kids that spending time with kids is ultra important. There’s no other way to know what kids are really like so that they can be portrayed authentically in your writing. Reading current middle grade books is equally important too. You’ll learn something new from every single one—both good and bad. But most of all writing a lot is a must. The only way to write an excellent manuscript is to write a poor one first—and maybe a mediocre one after that. My first few manuscripts were nothing stellar (far from it, in fact!) but I got better with each one and you will too. What’s next for Kia and the gang? I’m thrilled to say that their adventure is not over yet! Spin the Golden Light Bulb has paved the way for a sequel. Kia, Ander, Mare, Jax, and Jillian will be featured in the second of the Crimson Five books: Flip the Silver Switch…which will be released on July 10, 2018! There’ll be more inventions, more drama, and more creative tasks to solve. But this time there’ll be an international flavor with an extensive cast of characters, and even more secrets for the kids to uncover. And lastly: Are you, like your characters, an aspiring inventor? I wish! I’m constantly dreaming up ways to make everyday objects more f un and invent the next big thing. But I have no idea how to make any of the ideas I have happen! So I guess this book is a way for me to channel my inner inventor and showcase my own imaginary inventions! Thanks, Jackie, and wishing your book much success!